Dr Simon F. Park is a Senior Teaching Fellow at the University of Surrey, where he teaches Microbiology and Molecular Biology. For nearly 10 years now, he has also worked at the fertile intersection between art and science and here, his practice has been inspired by the aesthetics and processes of the usually invisible microbiological and chemical world. As well as collaborating with artists, he also produces his own work. ‘Crystal Worlds’ is an example. I’ve had an obsession with crystallization ever since I read J.G. Ballard’s “The Crystal World” as a teenager, and this has been driven by both the striking aesthetics of crystal formation, and also the remarkable transformative properties of the process, and its ability to spontaneously generate order from disorder. In his book, Ballard elegantly captures the outcome of the process, which so enthralls me. The same phenomenon has also played a vital role in the scientific process too. When biological matter is converted into an organised crystalline state, and then exposed to a beam of incident X-rays, these diffract along many different, but specific paths. After measuring the angles and intensities of these diffracted X-rays, a three-dimensional picture of the density of electrons within the crystal can be generated. In turn, this electron density map can then be used to determine the positions of the atoms in the crystal, their arrangement, and their linking chemical bonds. As proteins and nucleic acids can be coaxed into forming crystals, X-ray crystallography has been used to determine the structure of many important biological molecules including that of DNA. As detailed above, the process of crystallization suggests an inherent creativity in matter, and in natural laws, and it is perhaps not surprising then that many artists, for example Ackroyd and Harvey, Roger Hiorns and Tokujin Yoshioka, have all been attracted by the transformative possibilities of crystallization, and have been inspired by its manifold aesthetic possibilities. Crystals form in accordance with chemical and physical laws and so any artwork generated with them has to be, in some sense, auto generative, and thus beyond the absolute control of the artist. 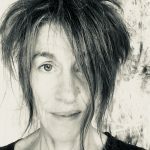 In much of my own practice, I rely on natural and universal laws to create autogenic forms of art, and I see my role here as a facilitator, so that the work fluctuates in the dialectic between my need to impose control and rigour as a scientist, and the often uncontrollable indeterminacy of the natural world. Consequently, as detailed below, I am naturally drawn to crystallization, as a willing and collaborating co-author in the creative process. However, as a microbiologist I’m also fascinated by crystallization as it occurs at the microscopic level and in revealing this normally invisible aspect of the process. Here, in the simplest sense, I record the crystallization of individual chemical species as in the videos below, and as order distils from a formless fluid under the objective lens of a microscope. (Video 1) The crystallization of silver nitrate at 100-times magnification and observed using Differential Interference Contrast microscopy. (Video 2) The crystallization of ascorbate (Vitamin C) at 100-times magnification and observed using Differential Interference Contrast microscopy. (Video 3) The crystallization of urea at 100-times magnification and observed using Differential Interference Contrast microscopy. I have very limited control over, or influence upon, the aesthetics of the single compound crystallization reactions above. 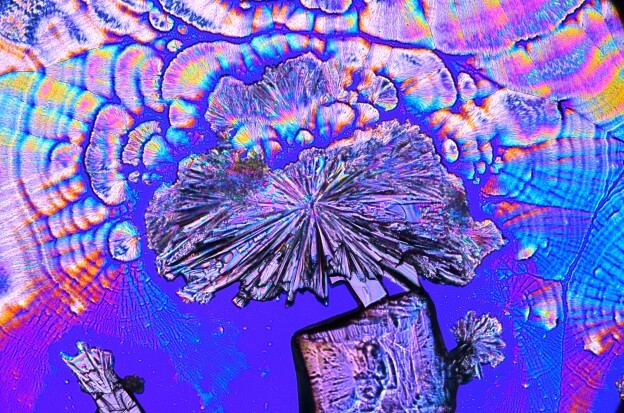 However, by mixing, experimentation, and creating cocktails of the different agents, I am able to generate bespoke crystallization reactions that are carefully tailored to generate specific aesthetics and speeds of crystal formation. In this sense, my contribution to the aesthetic is greater here, in that I am able to set the initial conditions and predict an outcome, but once the process starts however, it is irreversibly committed to a particular eventuality, over which once again, I have no control at all. (Video 4) The crystallization of a bespoke solution at 100-times magnification and observed using Differential Interference Contrast microscopy. (Video 5) The crystallization of a bespoke solution at 100-times magnification and observed using Differential Interference Contrast microscopy.